Get ready for the slots adventure of a lifetime in the new 5-reel, 243 ways to win Monkey King slot machine from Yggdrasil Gaming! This phenomenal game brings you into deep into the land of the Sun Wukong and boasts impressive features like Sticky Wilds, Count Down Wilds, Free Spins and a ton of other rewarding bonuses. This terrific game displays the high-end graphics we’ve come to love from Yggdrasil but on top of this, they’ve introduced an interactive Monkey King character to the game. So when you hit features like the Count Down Wild, the king will swing onto the screen like an acrobat to award you with the bonus. This action packed game also comes with a great soundtrack and a ton of features to ensure you get 100% of your entertainment value. If you like the theme, you can also try the other slots we have here at Slotorama featuring the same character including the 3D slot The Monkey King by Gameplay and More Monkeys by Lightning Box Games. Sticky Wilds – Whenever you win on a Stick Wild, it will stay in position until the next round. It stays as long as you keep winning! Stick Wilds only appear on the 2nd and 4th reel. Count Down Wilds – Count Down Wilds are like sticky wilds except they stay for three more game spins from your initial bet. Count Down Wilds appear on the 3rd reel. Monkey King Feature – The Monkey King can appear randomly and change one symbol into another symbol to your advantage. It’s always a surprise but always in your favour! Treasure Chest – In the base game, the Treasure Chest gives up to 1,000 coins or triggers the Free Spins mode. 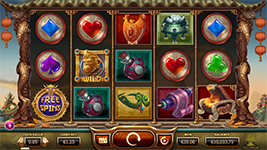 In the Free Spins mode, the treasure chest gives up to 1,000 coins or 2 extra free spins. You can find the treasure chest symbol on the 5th reel. Free Spins – Land 3, 4 or 5 Free Spins symbols anywhere on the reels to trigger the free spin mode. Landing 4 or 5 of the symbols will also win you instant prizes of 1,000 or 5,000 coins respectively. When you win the free spins, you’ll get to choose to activated one of three features which include Incremental Wilds, stacked wilds or starting wilds.